CNews : Whenever we think about police, a typical image of a tough and harsh man pops up in our minds due to the nature of their job. But a philanthropic cop has successfully challenged the common stereotypical ideas about police by getting into a fight for the integration of marginalized and underprivileged people of the country. 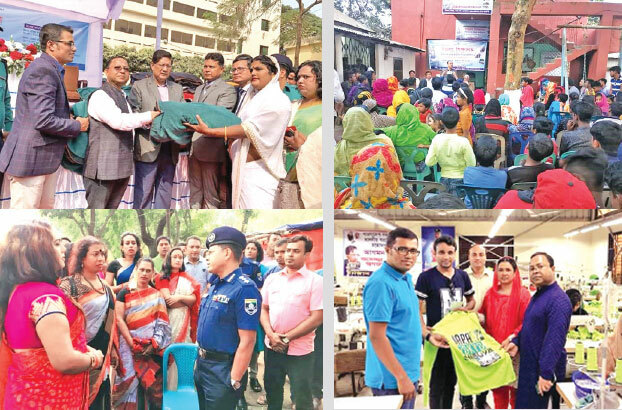 This big-hearted police official is none but Habibur Rahman, Deputy Inspector General (DIG) of Bangladesh Police who has made the difference by making charity one of the main components of his life. With his missionary zeal, this benevolent police officer has tirelessly been working for underprivileged people of the country, especially transwomen and water gypsies. Though he has informally been involved in many sorts of charity work since his early age, the altruistic cop embarked on his fight for humanitarian causes as the Superintendent of Police of Dhaka District in 2012. Habib then started building roads, mosques, Eidgah, and schools for transwomen and water gypsies of Porabari, Kalyanpur and Baktarpur areas of Savar upazila under Dhaka district. He has gradually widened the area of his philanthropic work for underprivileged and destitute people from all communities who are always in his thoughts. In order to make them self-reliant, the man with a mission has concentrated on employment generation activities for the underprivileged people. and beauty parlours, and gave driving license to their men. 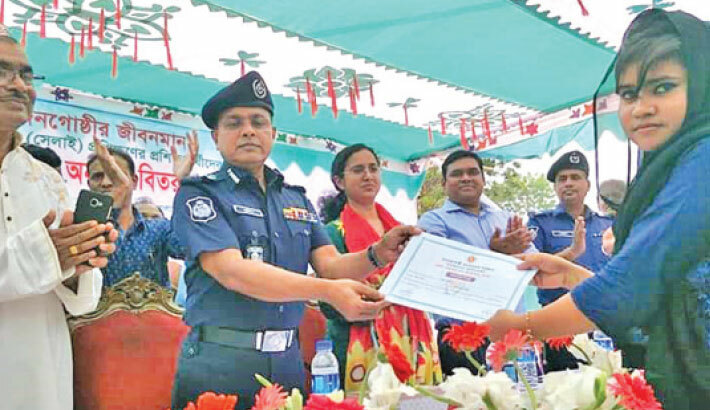 The prudent and benevolent cop has also involved transwomen of Savar, Dhamarai, Keraniganj, Ghendaria, Uttara and Moghbazar areas in community policing to ease city traffic jams. For transwomen, he has also established training institutes where they can receive training on boutique, beauty-industry related works, tailoring, computer, singing and dancing. In order to free them from poverty, ignorance and superstitions, he has initiated humanitarian policing and lifted-up lifestyles of many transwomen and gypsies. In the course of his sacred journey, Habib formally established Uttaran Foundation in 2017, though it has informally been active since 2013. With its many pragmatic and humanitarian initiatives, the foundation has successfully brought gypsy community of Savar into the mainstream society. The foundation has freed Bede Palli (gypsy community) of Savar from the curse of drugs and narcotics. Under the auspices of the foundation, he is currently working on the overall socio-economic development of members of water gypsy and transwomen communities of the country. The humanitarian cop also arranged the opportunity of sewing training for 150 gypsy women and 43 more were provided with jobs in different garment factories located in his area of responsibility. Habib also established a boutique house named “Uttaran Fashion” on a rented 2,600-square-feet one-storied building in Savar. He also set up two outlets named ‘Uttaran Fashion House’ at Savar and Ashulia for selling the garments products manufactured by the gypsy women. This is how he has taught many gypsy women live with independence and dignity, leaving behind the old profession of holding snakes, horns, wicker-baskets of snakes or bags of herbal medicines. For the welfare of gypsy children, he has established ‘Uttaran Shikhhaloi (Education Centre)’ in their locality where the children can receive education without paying any fees. Currently 120 gypsy students are being taught at the school. Other than this, he also arranged education for 317 gypsy students in different schools and colleges without fees. Moreover, he bought 40 decimals of land in gypsy locality with the assistance of local elites for establishing a school for gypsy students which the gypsy people named as ‘Habibur Rahman Primary School’. He also set up a computer training centre in Savar gypsy area named ‘Uttaran Computer Centre’ for the gypsy students who are already dropped out from the schools. Some 53 gypsy students are receiving computer and ICT related training at the centre. The most difficult task to him was to rehabilitate the gypsy male youths economically as they are idle by nature. He arranged free driving training for 35 gypsy male youths in ‘BRAC Driving Training School, Dhaka’ on 11 October 2015. With the assistance of the government and local elites, he is setting up a village named ‘Habib Nagar’ with the area of three acres and 70 decimals near Rupnagar village, Savar with a view to rehabilitating 150 gypsy families with all accommodation facilities. Apart from creating economic opportunities for gypsy people, Habib is also focusing on addressing the deep-rooted social evils such as early marriage, polygamy, dowry and superstitions that are prevalent in the gypsy-dominated areas. Apart from Savar, he has also focused on the socio-economic development of 5,000 gypsy people living in Kharia village, Haldia union, Louhojong thana of Munshiganj district. With a view to providing sewing and boutique training, and providing employment to gypsy women in that area, he is establishing ‘Uttoron Fashion-2’ with an area of 8 decimals in that area. Habib has so far managed to provide employment to 12 gypsy males in different government services including Bangladesh Police, 25 more in different private organizations and 60 in different garments factories. Apart from gypsy community, now another marginalized community (the community of transwomen) is dreaming to live with respect due to the efforts taken by Habib. He felt the necessity of rehabilitating the community when the unlawful demand of money, public nuisance, unsocial and unethical works and internal feuds of transwomen came to his notice in Savar, Dhamrai, Keraniganj, Shyampur, Uttara, Genadaria, Moghbazar areas of Bangladesh. As a part of rehabilitation of the community, he at first bought sewing machines and trained them on sewing and boutiques. Led by Apon Hijra, 25 transwomen are now working in “Uttaran Fashion” in Uttara, Dhaka where they are manufacturing garments. Another ‘Uttaran Fashion’ is being run by 10 transwomen people in Turag, Tongi where they are also engaged in ready-made garment production. He has recently launched ‘Uttaran Employment Training Program’ in Moghbazar, Dhaka where 10 transwomen are receiving sewing, boutique, embroidery, cooking and beauty parlour related training sequentially and will be provided employment after judging their working efficiency. Three beauty parlours, run by 15 transwomen, have already been opened in Savar, Ashulia of Dhaka district and Brahmanbaria district. Two other beauty parlours for transwomen are going to be opened in Manikganj district soon. ‘Uttaran Dairy Farm’, run by transwomen, has already been opened in Uttara, Dhaka. ‘Uttaran 2nd Dairy Farm’ for them was opened in Gaibandha district. Moreover three transwomen are working in Ashulia area of Dhaka district as community traffic police. A full-fledged training institute is also going to be launched by Habib where transwomen will be provided training on boutiques, parlour, sewing, computer and traditional dancing. ‘Uttaran Foundation’ played as one of the key actors in the campaign of acknowledging transwomen as ‘third gender’ in Bangladesh. As a result of effective intervention and campaign of the foundation, the government of Bangladesh set a landmark decision by acknowledging the transwomen as ‘third gender’ which has secured their rights and enabled them to identify their gender as ‘transwomen’ in all the government documents including passports. Besides, an agreement was signed between ‘Uttaran Foundation’ and ‘Habib Foundation’, founded by world-famous hair stylish Javed Habib. Under this landmark agreement, two transwomen nominated by Uttaran Foundation will have the opportunity to receive training in India on hair fashion under the supervision of Javed Habib. In accordance with the accord, on February 01, 2019, two members of transgender community Sammi and Nishat flew to India for receiving one-month long training on hair fashion. With his versatile contributions to the marginalized and backward communities of the society, Habib has already earned fame as ‘a cop of deep humanity’. Apart from playing roles in changing the fate of the destitute people, he has long been inspiring his fellow policemen to be a rare example of generosity in the society. The cop blessed with outstanding humanitarian qualities has set a unique example of love towards the under-privileged and marginalized people by transcending the boundary of professional limitations and responsibilities. Be means of his dedication and determination, he has literally transformed the lives of the marginalized communities and made a transition (in Bangla ‘Uttoron’) from life full of ultra-poverty, illiteracy, drugs and social evils to life full of prosperity and dignity. In return, he has equally been loved by those people. The gypsy people have built a new mosque in their area and named it ‘Habibia Mosque’ after his name. A man from Gopalganj, Habib was grown up and educated from the same place as the Father of the Nation Bangabandhu Sheikh Mujibur Rahman. Being born in a family inspired by the teaching of progressive thinking, broader outlook and welfare mentality, he was involved in many social, development and progressive activities from the very childhood. He had the opportunity to witness the Liberation War in 1971 as an adolescent and since then he has nurtured the spirit of Liberation War with a view to establishing a discrimination-free and non-communal Bangladesh. All his charitable works are just part of that great vision.